Photographer and stargazer Renata Arpasova clenched her tripod in the gusting winds early Wednesday and was rewarded with the sight of 100 meteors charging across her sky in Swindon, England. Arpasova shot 420 back-to-back images of the Quadrantid meteor shower between 3 and 7 a.m. armed with a Canon 5DMKII, tripod, remote release and a fisheye lens to cover as much of the sky as possible. She blended 19 individual shots into this composite image, which she shared with CNN iReport. Using the Ursa Major constellation as a reference point, Arpasova says she tried to rotate the images so as to imitate the Earth’s movement. See more of her photos at her website and Flickr page. 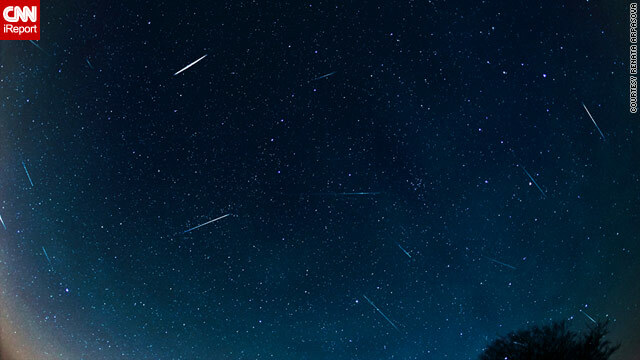 If you enjoy counting stars and tracing comet tails, we want to hear from you. Share your photos and video of space and show us rocket launches and celestial happenings near you. I don't pay for gas, directly, oamynre. I don't have a car. I ride public transportation. Today, I saw the Golden Bear gas station on Morena selling regular for $3.97 and $4.17 for premium. But I've heard the gas is crap.When the gas prices go up like this, $5 for all day on MTS seems like a bargain. It cost a little more to ride the Coaster up north, but the view from the Coaster is absolutely spectacular along the cliffs of Del Mar!